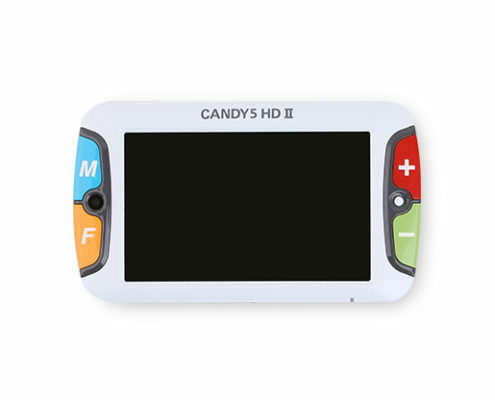 CANDY 5 HD II is a handheld (with handle) 5.0″ LCD HD video magnifier with a unique, ergonomic 3-position handle that can be comfortably held in the center-balanced position, for right-handed or left-handed use. 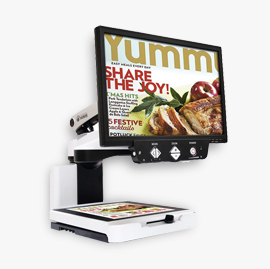 Alternatively, use CANDY 5 HD as a Stand magnifier by pulling out the folded leg and CANDY 5 HD II operates similar to an optical stand magnifier. 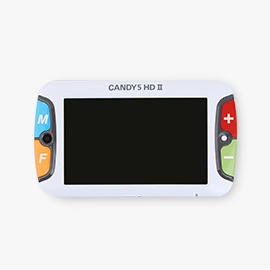 The new CANDY 5 HD II features a 5” high-definition wide-screen LCD and continuous zoom magnification from 2.5x – 22x. 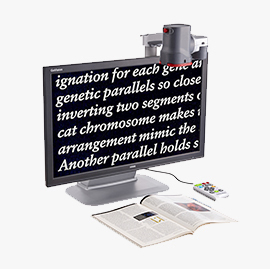 This versatile video magnifier has an intuitive center-position HD autofocus camera and can be used as either a “handheld” or “stand” magnifier. 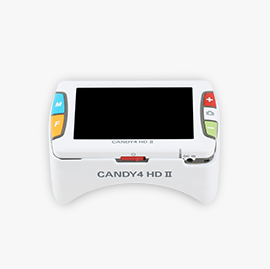 Use CANDY 5 HD II at home or take it with you to school, work, restaurant, pharmacy, bank, library, grocery or department store or on vacation. 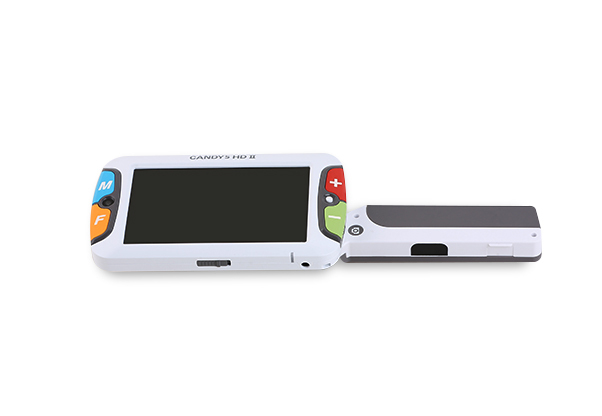 The new CANDY 5 HD II features a 5” high-definition LCD, ensuring a clear, high-quality image. The large LCD display provides 4x greater field of view than a similar magnification optical magnifier, and the HD image quality provides a 3x higher resolution from the camera to the LCD. Save Up to 5 images. Easily find and review any saved image. Easily customize 4 selectable color modes from a number of preset combinations in addition to the standard natural color mode. Users can also disable unused options to simplify menu choices to only those which they use most often. CANDY 5 HD II will quickly auto-focus when the user changes from close-up to near-distance viewing. 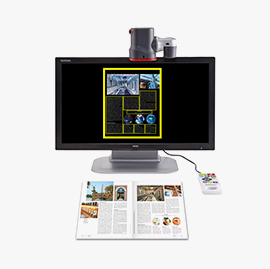 Continuous zoom allows you to quickly adjust your magnification level without the need for multiple button presses. CANDY 5 HD II doesn’t limit you to only 3 or 4 preset magnification choices as most other portable video magnifiers. Quickly check the current time right on your CANDY 5 HD II. Featuring 4.5 hours of battery use time on a full charge, CANDY 5 HD II has the longest lasting battery run time among handheld video magnifiers. 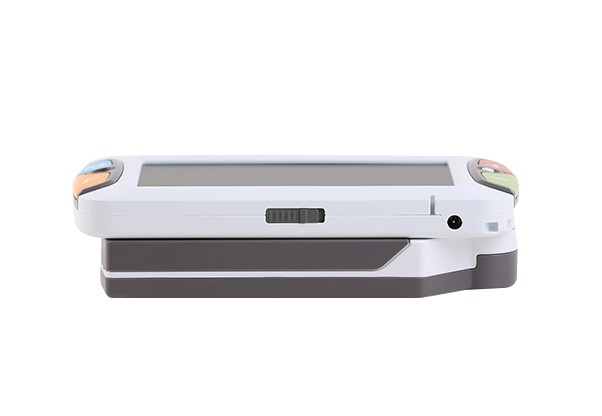 The built-in rechargeable lithium battery recharges within 3 hours with the included AC adapter. 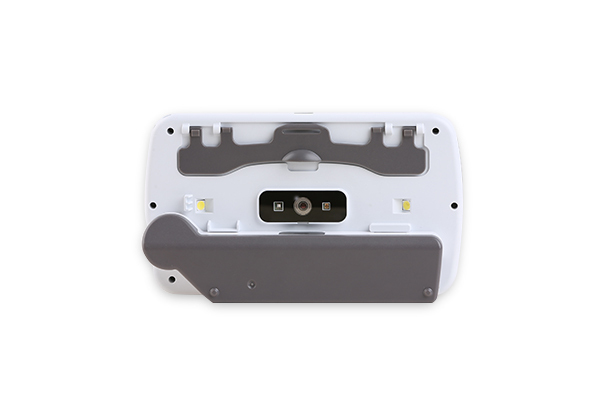 The center-position camera makes it easy to know where you are reading.